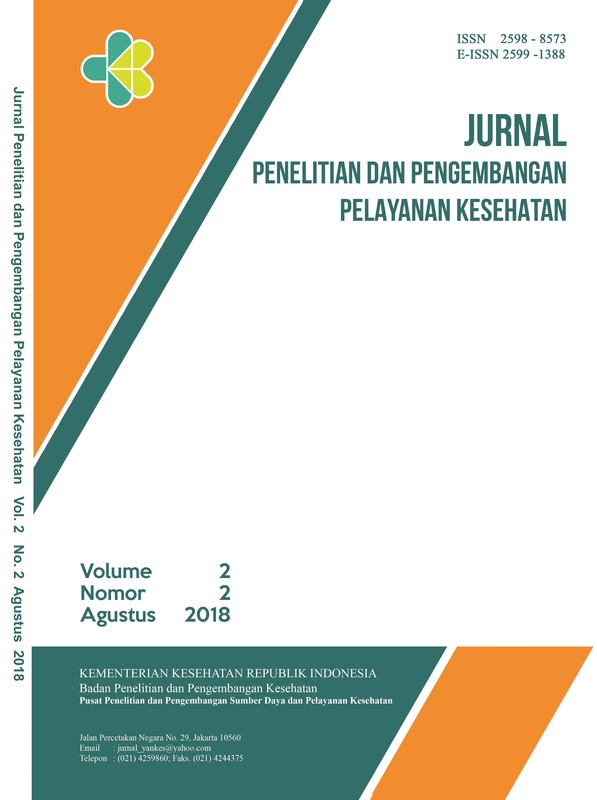 “Jurnal Penelitian dan Pengembangan Pelayanan Kesehatan (Journal of Health Service Research and Deveplopment)” is one of the journals published by Pusat Penelitian dan Pengembangan Sumber Daya dan Pelayanan Kesehatan (Center for Health Resources and Service Research and Development), Ministry of Health of the Republic of Indonesia. Jurnal Penelitian dan Pengembangan Pelayanan Kesehatan (Journal of Health Service Research and Deveplopment) published 3 times a year. Journal which is first published in August 2017 is a forum for communication of research results, review the results of research, methodologies and new approaches in research related to health efforts in Indonesia. See Google Scholar Profile for Jurnal Penelitian dan Pengembangan Pelayanan Kesehatan (Journal of Health Service Research and Deveplopment) by clicking here. Jurnal Penelitian dan Pengembangan Pelayanan Kesehatan (Journal of Health Service Research and Deveplopment, p-ISSN: 2598-8573. e-ISSN: 2599-1388) is published by Center for Health Resources and Service Research and Development, National Institute of Health Research and Development, Ministry of Health of Republic of Indonesia.